Before and post war, and throughout the communist time, Czechoslovakia was an industrial nation and was always building cars. Tatra became the third automotive manufactured in the world and it still produces trucks. Skoda started producing guns and motorcycles decades before they made their first car in 1905. During the war almost all manufacturing facilities were ran by the Germans, producing equipment for the Axis forces. Like with others in this series, we will focus on post WW2 Czechoslovakian cars that are currently living and dying on the streets on Poland, all thanks to the readers of the Polish website zlomnik.pl. 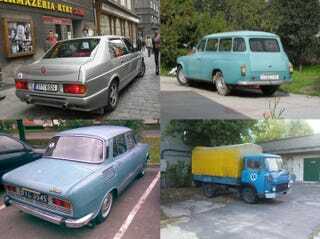 Be sure to check out the rest of the series: West German cars, East German Cars, Japanese cars, Italian cars, 'Murican Cars, and French Cars all living and dying in Poland.